When you look up "laid back" in the hiptionary, there's a photo of a Tulsa man in front of an Airstream trailer, with the brim of his weathered hat shielding his eyes from the sun, and especially from the camera. That'd be John Cale. One of the most reluctant legends of rock and roll history, he is nevertheless an essential songwriter and guitar stylist in the idiom. He came out of the club scene in Tulsa (where he was born and raised) in the 60s to L.A. with his friends, bassist Carl Radle and drummer Jimmy Karstein. Their buddy Russell Bridges had already blazed the trail and assured them there was money to be made in the studio. (That was before Russell Bridges would become Leon Russell in the unpredictable imminent future.) John had studio chops, and went to work as an engineer, playing gigs at night. 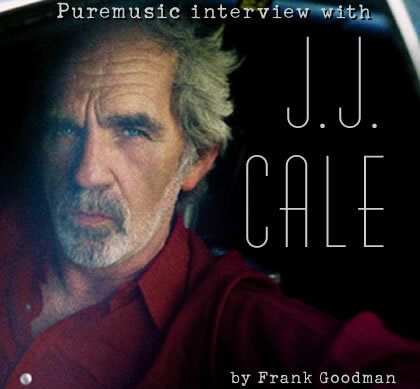 It was actually the owner of the Whiskey who suggested his stage name, J.J. Cale. Although many others have covered his tunes over the years, it's the Clapton covers that raised John Cale up to cult figure status. But aside from Cale's songwriting power, his guitar style was irresistible and very influential, certainly no more obviously than in the playing of Mark Knopfler, though Cale characteristically backpedals the notion. He is an incredibly understated and reserved person, his personality apparently unsuited to airplane runway lighting, and he's been known to spend a lot of time in the desert or by the water in his trailer. Over the years, precious few interviews have been given--so you can imagine how very grateful we felt to have been granted one of the small number that he would do for his new CD. To Tulsa and Back is his first studio record in over seven years.